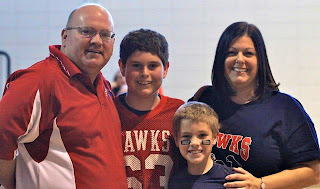 R1 had his first pep rally and football game last Thursday. A friend was at the pep rally and snapped this picture. I love it! Oh and we won, 38-8! Go Hawks! Nice picture of you all! That's a GREAT Picture!! Cody is a Hawk, too! :) Go Hawks!